Noosa. My favorite store brand yogurt, as I've reviewed before, because it is basically dessert. While not all flavors are amazing, the salted caramel and lemon have long been my favorites. 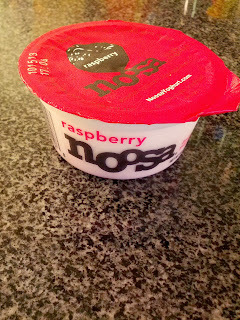 But Noosa continues to introduce new flavors, and I continue to try them all, no matter how strange they sound. 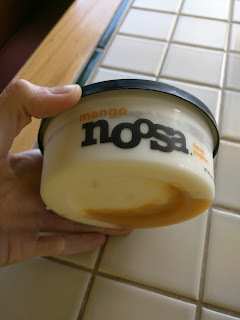 This batch of flavors were all interesting, and the yogurt was still the same creamy, rich noosa I love, but, none of the new flavors did it for me. I'm glad I've tried more, but, I'm going back to my old faves. 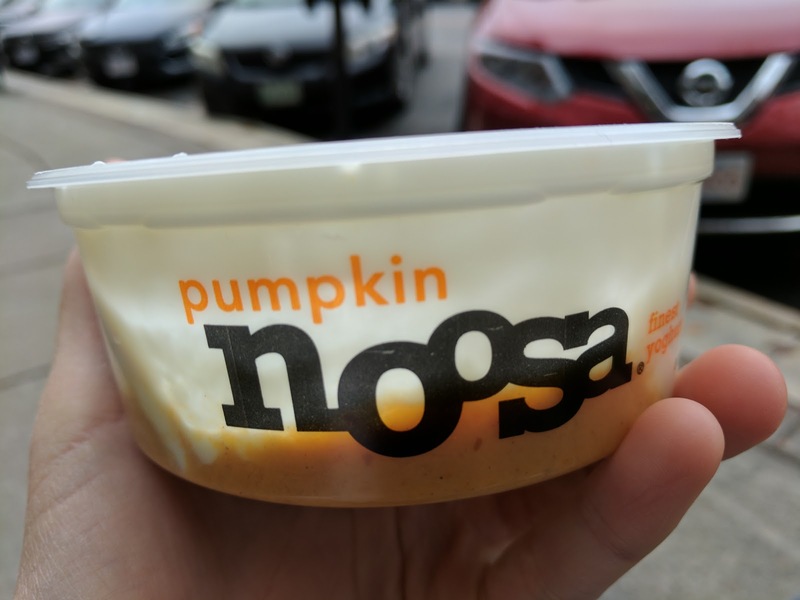 “The crisp days of fall call for the smooth taste of noosa, with our own spin on traditional pumpkin pie. This seasonal noosa will carve out a place in your heart with the warm, rich spices in our pumpkin puree." I was hoping that this would be like pumpkin pie. With creamy noosa on top. Creamy pumpkin pie. Mmmm. It ... wasn't. 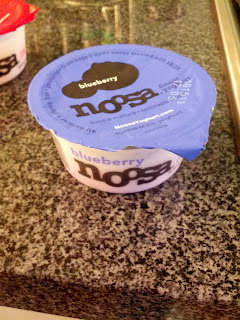 Sure, the yogurt was standard creamy, rich noosa and I liked the yogurt itself. But the pumpkin puree layer was ... just orange pudding? It didn't taste like pumpkin, and it certainly didn't have the spices of pumpkin pie (not that it claimed to). It was very bland. Overall, the yogurt was fine, but, the pumpkin was a disappointment. "Sometimes we like contrast, and other times we crave a single intensity. Smooth, creamy coconut mixed with smooth, creamy noosa yoghurt is perfect for those times. Every luxurious spoonful of real shredded coconut is yum in every way." As always, the yogurt was creamy and rather decadent, but fairly plain (although sweet) on its own. 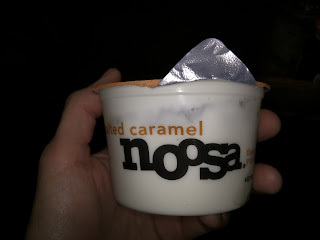 Unlike most other Noosa flavors with very visible fruit puree layers though, this one was almost entirely white. Because, well, coconut. The coconut layer was, as always, located on the bottom/side of the container, available for me to mix in as I desired. It was a bit hard to find though, since the colors were so similar. The coconut layer was a puree of sorts, made from coconut, coconut cream, sweetened condensed milk, and lots of sugar. It was basically just tons of shredded coconut, in a thickish sweet sauce. It reminded me of German chocolate cake filling, just, sans any chocolate. It was quite sweet since it was considerably sweetened, which was just a bit odd with the coconut flavor. It also didn't taste *that* coconuty, although it was clearly made of shredded coconut. The texture of all the shredded coconut was a bit off putting. Overall, this was ok, but, you certainly have to like shredded coconut and sweet. I wanted to add cocoa powder, or chocolate sauce, or chocolate chips, or something and turn it into a German chocolate cake. "Close your eyes and visualize your favorite spoon. 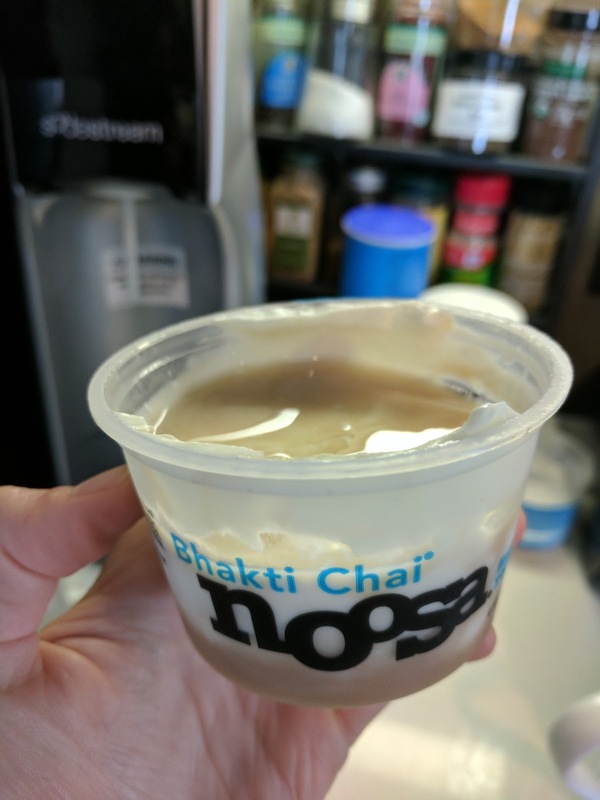 Now, picture yourself digging into a creamy yoghurt blend of chai tea and masala spices from our favorite local chai company: Bhakti. There’s only one way to describe it. Namastasty." Well, hmm. This isn't a combination I would have thought of, or, honestly, picked out on the street. But Ojan brought it to me to try out, as he knows I love trying new Noosa flavors. It was ... interesting. 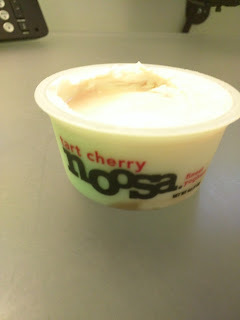 The yogurt was thick, rich, creamy, delightful Noosa yogurt as always. And the chai? Well ... it was kinda watery, sweet, spiced syrup that I don't entirely want with my yogurt. Unlike most Noosa, there seemed to be some on top too, not just on the bottom as is standard. I wonder if that is because it is more watery than other flavors, so it seeped up the sides? Anyway, it was Chai, for sure. And it was well spiced. Just not really my thing. "Rob (our co-founder) has a new favorite flavor: this one. Go ahead. Dip your spoon into our marionberry blackberry and serrano chili noosa. It’s sweet, then spicy, then creamy, then gone." Ojan picked this one up for himself. I didn't take a photo, as it was his yogurt. But I did steal a bite. It was too crazy for me not to review. Blackberry. Serrano. Yes, chili pepper. In yogurt. The spice made it incredibly savory, even though the blackberry component was sweet. It was spicy. Serious kick. So strange. So very strange. Let's talk about yoghurt. Or yogurt. Obviously, not a subject I've really reviewed before (except when mentioning it in hotel breakfast buffets or when chains like Starbucks or Pinkberry introduced new versions). And to be honest, I'm not generally a yogurt eater ... unless it is froyo of course. The fact that I'm not into yogurt isn't really consistent with what you'd expect, given my love of puddings, panna cotta, and other creamy, rich, dairy based desserts. Which perhaps is the problem. I always want yogurt to really be dessert. And generally, it just falls short of that line. Enter Noosa. 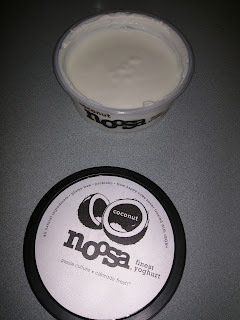 They sum it up pretty well: "We’re noosa, and we make yoghurt. But not just any yoghurt. Ours is thick and velvety. Sweet and tart." It really is quite different from other yogurt. The texture really is thicker, yet creamier, than other yogurt. I'm not sure how they do it. Besides the plain, all flavors have a compote you mix in. Noosa was started by an Australian ex-pat who lives in Colorado. In Australia, this sort of yogurt is common - a big container of rich, creamy, full fat, delicious yogurt, generally topped with something like passion fruit. Every corner market has it. Yogurt is big there. So when the founder of Noosa moved to the US and couldn't find it, she decided to fix that. Enter Noosa. She puts the fruit compote on the bottom, but, besides that, it really does remind me of the yogurt in Australia. The flavor variety is fairly extensive at this point, mostly fruit based, but, recently they have gotten a bit trendy with a pumpkin and salted caramel flavors. 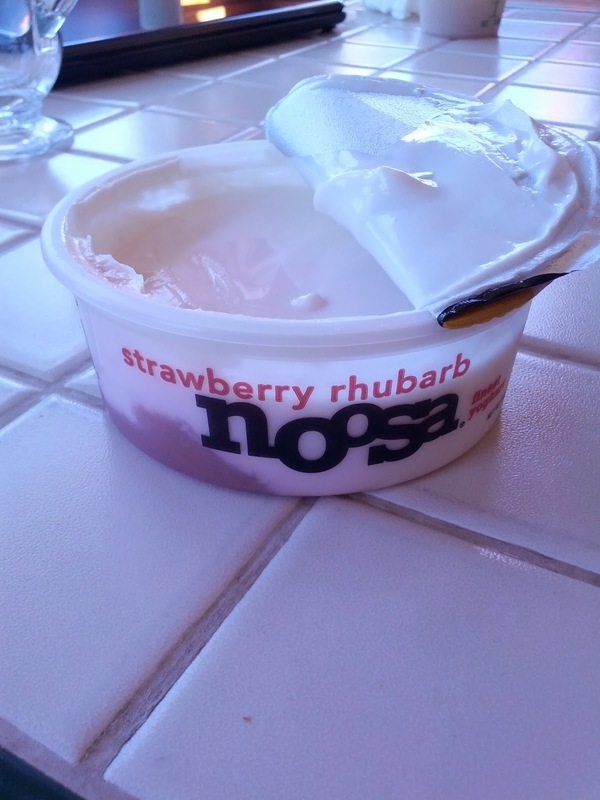 Noosa is still yogurt, don't get me wrong, but, some flavors in particular are close enough to crossing into dessert territory that if you are looking for a guilt free tree it really might satisfy, particularly with a crumble of some sort sprinkled on top. 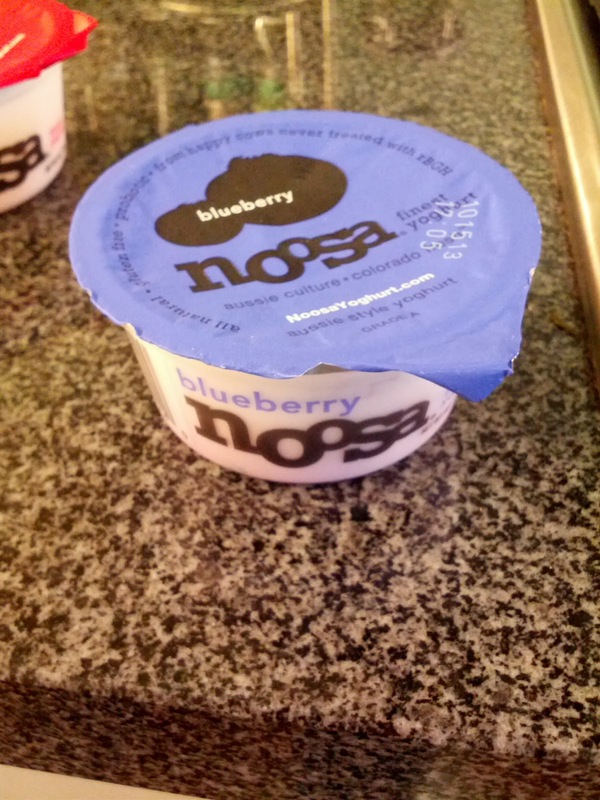 "Sure, you’ve tried blueberry yoghurt, but blueberry noosa is in a league of its own. Off-the-charts in yum, our best-selling flavor inspires cravings like no other with sweet, juicy blueberries hidden beneath our creamy yoghurt." This was the first flavor I ever tried. The yogurt was almost a cross between what I know as Greek yogurt and American yogurt. It was clearly thicker than traditional yogurt, but creamier than Greek yogurt. Australian style? Anyway, I liked the fact that it was creamy and thick. I certainly see why people love this yogurt, texture-wise. But in terms of flavor, this variety didn't do it for me. The base yogurt was pretty flavorless, which is fine, as you are supposed to mix in the blueberry. The blueberry was a compote in the bottom that I could mix in as desired. It wasn't too sweet, which I appreciated. There seemed to be just the right amount of fruit vs yogurt, which I also appreciated. There were whole little blueberries, also appreciated. Everything about this spelt success, yet it didn't do it for me. I clearly just needed to try another flavor, since, it was *almost* amazing. "Raspberries picked at plump perfection are bonza all on their own, but taste even more yum when mixed with our luscious and velvety yoghurt. 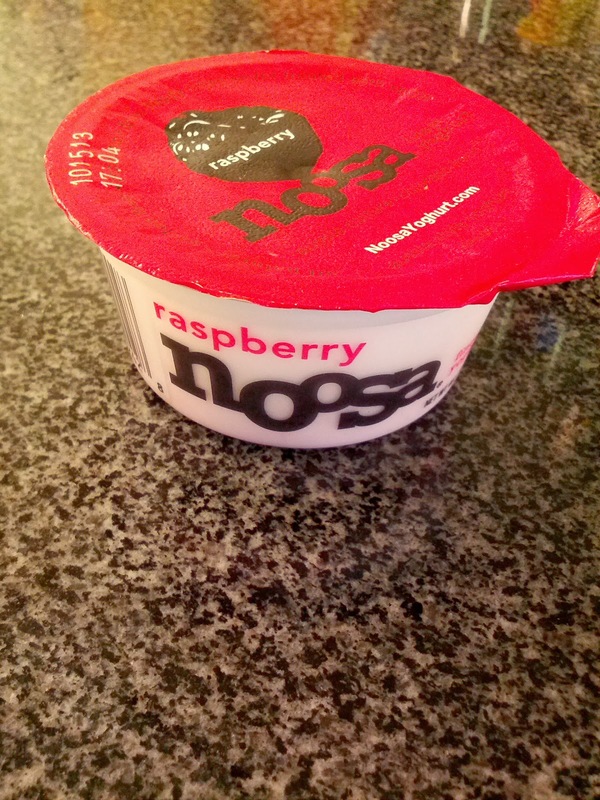 A little bit tart, a little bit sweet, and a whole lot delicious, raspberry noosa is a dazzling experience." The next flavor I tried was raspberry, as Ojan said raspberry is one of his favorite yoghurt flavors. Like the blueberry, the consistency of the yogurt was great, thicker than standard American yogurt, but creamier than most Greek. Because it is full fat, it had a luxurious feel to it. Again, like the blueberry, the raspberry came as a compote on the bottom. I tried the yogurt plain at first and it was boring, I tried the compote plain and it was just sweet, but once I mixed it all together completely, a nice raspberry flavor came out. Not quite as flavorful as I'd like, but I appreciated that it wasn't too sweet. I didn't love the compote though, perhaps I just wasn't in the mood for raspberry flavor. The mouthfeel is really where this yogurt it wins though. It almost feels like you are eating a dessert. Topped with fresh fruit and granola crumbles, it was even better. I probably wouldn't get this flavor again, but I'm now convinced that I just need to find MY flavor! "When life gave us lemons, we mixed them with our unique, velvety yoghurt. 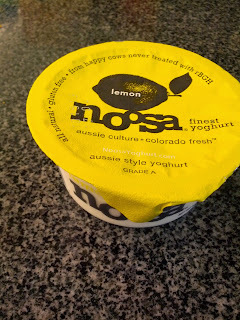 The smooth, silky, and perfectly tart lemon curd is a ray of sunshine at the bottom of every lemon noosa tub." And the winner is ... lemon! This shocked me, as I don't really like lemon flavored dessert-y things. Lemon squeezed over salmon? Yes. Lemon has its place. But in my desserts, for some reason, no! Nothing disappoints me more than finding out that dessert is going to be a lemon cream pie or lemon bar. So I didn't expect to like this at all. At first glance, it was just like the others. Creamy but thick base, lemon fruit puree on the bottom. I tentatively tried the fruit puree, ready to recoil. But instead ... I just dug back in. It was tangy. It was sweet. If I thought the raspberry flavor was almost dessert, this one certainly was. Even better with granola crumbles on top. Next time, I'm getting a bigger container. And trust me, there WILL be a next time! "Strawberry whaaaa? We put our own spin on the classic flavor of sweet, succulent strawberries and added tangy, tart rhubarb. No matter what hemisphere you hail from, you can’t resist this tempting combo." I feel like a broken record at this point. The yogurt base was the same creamy yet thick consistency that I liked. The fruit wasn't too sweet. Is this my first choice of flavor? No. But, like the raspberry and blueberry, it had all the right things going on, just, strawberry rhubarb isn't my flavor. "The satiny tropical flavor of a sweet and tangy mango takes us back to those lazy days at Noosa beach. Enjoying it during a lounge in the sand has been known to enhance the yum-factor of the exotic fruit." Like all the Noosa yogurts, the yogurt and fruit are separate, with a layer of the mango purée on the bottom, off to one side, so you can mix it in. You can guess how I felt about the mango. Still not for me. "Imagine a slice of tart cherry pie served with a side of creamy, lightly-sweetened yoghurt. " It didn't wow me. As always, the yogurt was fairly creamy, and a great thick consistency. The tart cherry was in the bottom, a compote with pieces of cherry in it, slightly tart. It was fine, but, not one I'd go for again. I wanted more cherry, and larger pieces of cherry. Really, I guess I just wanted cherry pie. "Some things in life are too good to be true. Thankfully, the combination of salty, sweet, melt-in-your-mouth caramel and our thick, velvety yoghurt isn’t one of them." And this ... this is what all my noosa dreams are made of. When I saw this flavor, let's just say, I was excited. I love the base noosa yogurt, but, most of the fruit compotes haven't *quite* don't it for me. But salted caramel? Um, yes! And, it delivered. The same signature, thick, creamy noosa yogurt. Decadent enough on its own. But this time, instead of a fruit compote or puree, there is a caramel. Sweet, flavorful. For all the times I've thought that noosa yogurt was basically dessert ... this one really went a step further in that direction. It wasn't as full fledged sweet or desserty as would actually satisfy me for dessert, but, for a mid-afternoon snack, it was truly delightful. My favorite, although, the lemon remains a close second. Some people live by "an apple a day". I tend to live by "a bowl or cone of something frozen a day". By which I mean, I really do tend to have ice cream, frozen yogurt, or some other frozen treat nearly every day. The fact that I work somewhere with a froyo machine helps of course, as does my very stocked freezer. Gelato though is not something I have often, since usually you want gelato super fresh, and there just aren't that many gelato shops around (although, if you ever wind up in Hanover, NH, I have a shockingly good gelato recommendation!). 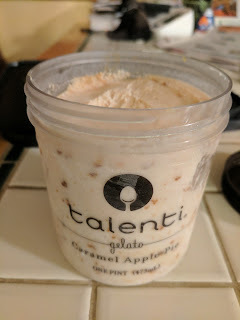 I didn't expect to find good packaged gelato, but I remember the first time I tried Talenti Gelato at a friend's house, and I was quite surprised, particularly when I learned that it isn't a local, artisinal, etc gelato. No, Talenti is a large production, grocery store standard brand, although one made with quality ingredients - they use real Tahitian vanilla bean, Callebaut Belgian Chocolate, and even make their mint gelato green using alfalfa sprout extract. I also love the packaging, in plastic, clear pints, which I love to save and reuse for other purposes. I don't really understand the standard of cardboard pints that don't seal as well. Talenti makes a slew of flavors of gelato, plus sorbettos, and novelties on sticks (dubbed "Pops"). I've never tried the sorbettos or pops, but I've had my share of the gelato, and always found it quite good, particularly for a grocery store item. "Talenti makes this gelato classic with whole, fresh roasted pistachio nuggets and homemade pistachio butter, lightly blended together with fresh gelato to create this all-natural flavor." I don't normally like pistachio. I'm not sure why. Not just in ice cream, it just isn't a flavor I go for in anything. Yet ... 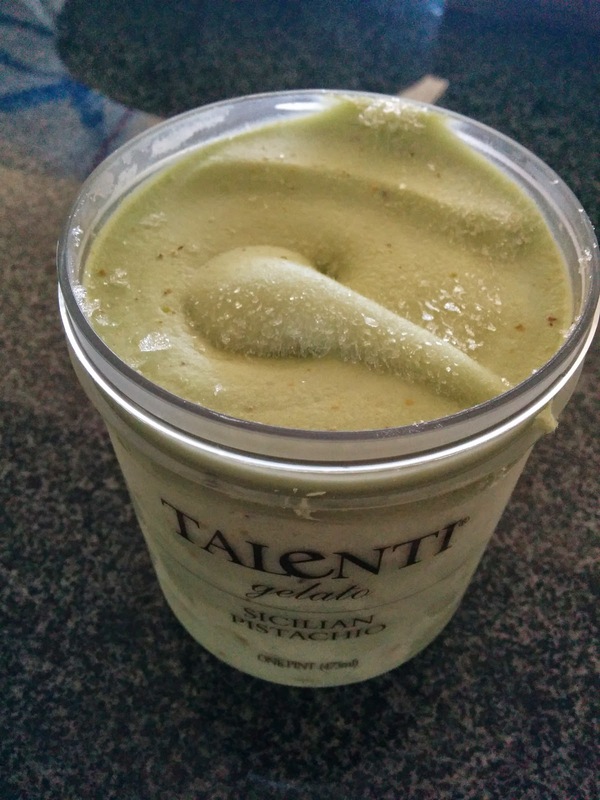 I love this pistachio gelato, and it was the first Talenti flavor I ever tried. Why would I try it, if I don't like pistachio? Well, that is easy. I was at an ice cream party, and there were a slew of flavors to try. I tried just a tiny bite of this, and it ended up being my favorite thing of the night. Who knew? So, when I saw it at the store a few months later, I bought a pint myself. I again liked the flavor, but not quite as much as I did in my memory. Still better than any other encounter I've had with pistachio, but, it wasn't quite as magical as at the ice cream party. I did appreciate the crunch from the little bits of pistachio in it, and the creaminess of the base. 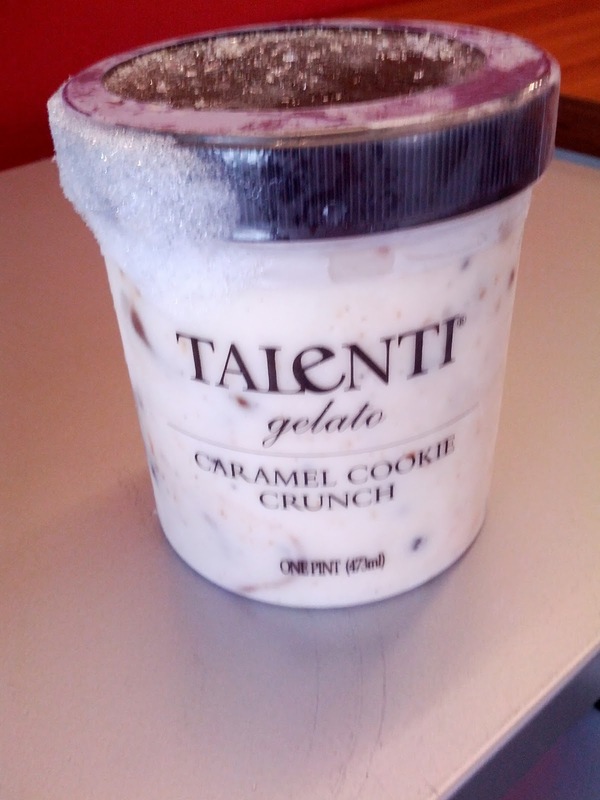 "Crunchy chocolate cookies are combined with Talenti’s Dulce de Leche and blended in just as the gelato is being hand filled into the jars, transforming standard cookies and cream into a luxurious treat." I am generally all about toppings, and sundaes, so I appreciate ice cream (and gelato) flavors that come with all the mix-ins, for times when I'm lazy or just not well stocked on my own. This flavor did have some decent mix-ins. First was a swirl of caramel, or, I guess dulce de leche, that was sweet, gooey, and satisfying. Next, bits of cookie added crunch, and were well distributed throughout (and for chocolate cookie bits, they were pretty good). I would have preferred something like nuts, or cookie dough, not just crunchy cookies, but still, good. Overall, this was fine, but not particularly memorable, or worth getting another pint of. "Bits of flaky piecrust and apple pieces are blended into our one-of-a-kind cinnamon gelato. We lovingly kissed it with a caramel swirl and–bam!–put America into a pint." This was very good gelato. The base gelato was rich, creamy, and airy, and tasted more like fresh gelato than any packaged variety I've ever had. It had a good cinnamon flavor, not too strong, but definitely such that you knew it was a cinnamon base. And then, the mix-ins. I loved the swirls of sweet caramel, they complimented the cinnamon base very well. The chunks of pie crust were interesting. I do love pie and ice cream, and the chunks were plentiful and well distributed. But ... pie crust inside ice cream does get a bit soggy, so it suffered in similar ways to some of the Ben & Jerry's flavors I've had, like the waffle cone in Americone Dream or potato chips in Late Name Snack. Overall though, a very complete flavor, and I was happy to eat it as is, no need for additional toppings. It went beautifully with a warm cinnamon roll too! Ramuntos is a pizza chain in my hometown in New Hampshire. It opened sometime when I was in high school and quickly became our top pizza place. It was the first "New York Style" pizza I had ever had, and the Sicilian style was also a first. I have a lot of memories involving Ramunto's pizza. Ramunto's opened several more shops around the area, but then I think there was some drama, as several stores shut, and the others remain open, but with different websites, and new logos and branding. The location my family always ordered from was in Enfield, closest to our house, and it closed. The next closest was in Lebanon, and that location closed, but a new one opened, now branded as "Ramunto's Brick Oven Pizza" (with www.lebramuntos.com as their site). Then in Hanover there is "Ramunto's Brick & Brew Pizzeria" (www.ramuntospizza.com). Which of course made me wonder, who has www.ramuntos.com? The answer is someone with the same logo as the Lebanon location (but a different favicon!). They have 5 other locations in NH and VT, plus some locations inside Jiffy Marts, and advertise franchising opportunities. So ... yeah, something happened there, not sure what. Anyway, all locations feature many of the same menu items, although Lebanon has fried items, Hanover does not. 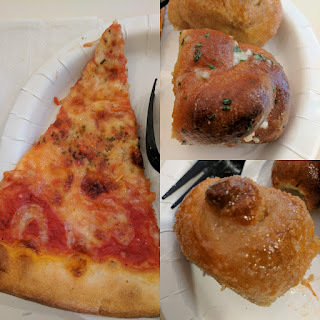 All have the "Famous" garlic knots. On this visit, I ordered from the Hanover version. 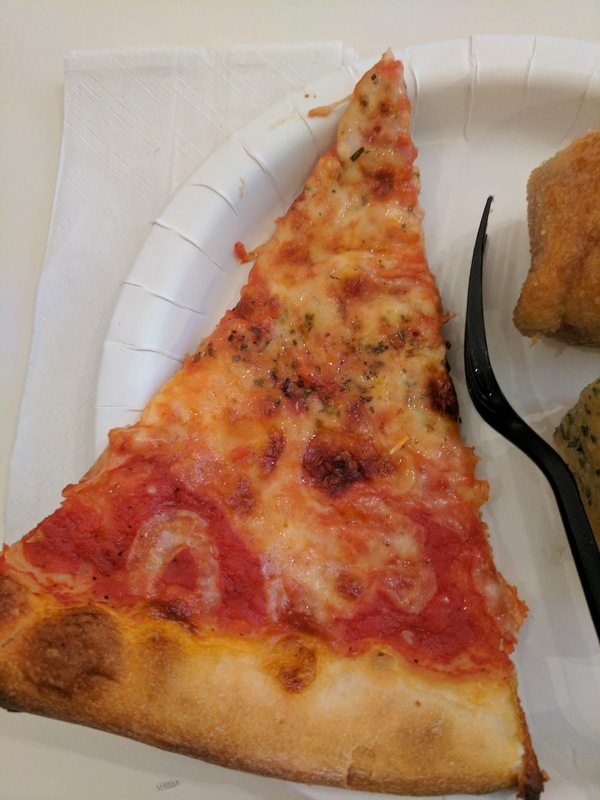 The pizza was solid, likely the best in the area. And the knots lived up to their fame. At the core though, it is just a pizza place in a random town in New Hampshire, and is not notable beyond that. Ramunto's offers classic pizza joint appetizers, like buffalo wings, nachos, chicken fingers, and potato skins, plus their signature item: "famous" knots. 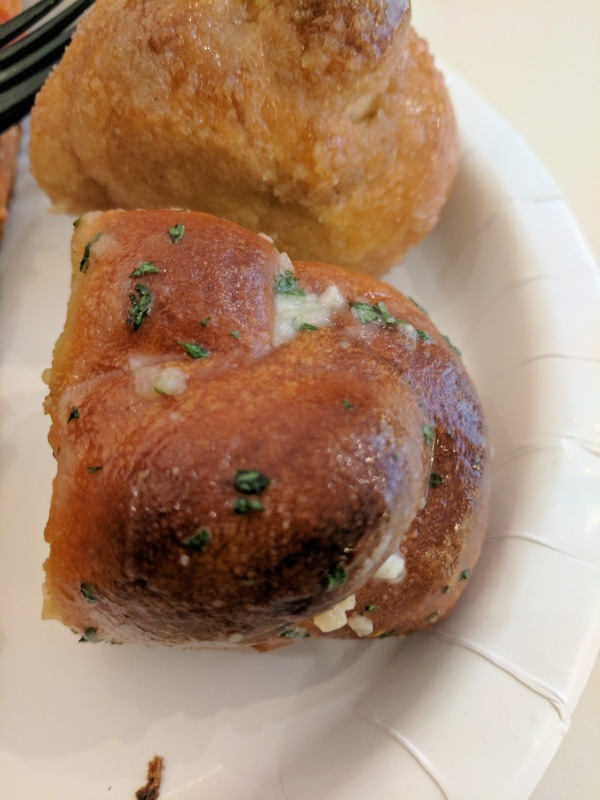 Garlic & Romano Knot (front). $0.90. smothered in parmesan cheese with our famous garlic olive oil". In Hanover, where I got them, simply "Garlic & Romano Knot". Maybe the recipes have changed from location to location, some preferring parmesan over romano? Anyway, they are chunks of pizza dough, formed into knots, topped with tons of oil, garlic, cheese, and herbs. They were delicious, but in a rather awful way. The dough wasn't anything special and the knots were actually a bit dried out (particularly inside) and the tops were a little burnt. I think they were overcooked slightly. And they were soaked, literally, soaked, in oil. I honestly think you could have wrung them out. Literally, 1/2 inch at least in from each edge was fully saturated, soggy almost. I know this sounds horrible, and, at some level, it was. But it was also delicious, at least, the outer layers were. Oil, tons of garlic, and cheese, with some dough as a vehicle to soak it up? Not a bad thing. But as I said, the inside was dried out and since the oil didn't reach there, that part wasn't great. I still enjoyed my knot. Sold in Hanover for $.90 each, $4.25 for 1/2 dozen, or $6.50 for a dozen. No other store sells individually. In Lebanon, they are cheaper ($3.99 for half dozen/$5.99 for dozen), in Claremont, they are more ($4.79/$6.69), and in Bennington, cheaper for half dozen ($3.99) but more for a full dozen ($6.95). Yes, I find the pricing, and description, differences novel. The main attraction is of course pizza, available in wood fired brick oven style, New York hand tossed, or Sicilian. If you aren't into pizza, other options are calzones, hot paninis and heroes, cold sandwiches and subs, wraps, salads, and pasta dishes. But the pizza is really what they are known for (besides the knots of course). I opted for a slice of classic cheese. It was fine. The crust was better than the crust at other places around town, but I wouldn't say it was extraordinary in any way. There is just a low bar around the area. The sauce was sweet and tangy, and applied in just the right amount. Cheese, also applied in the right amount, nicely melted. Sprinkle of herbs for some oomph. Overall, not particularly notable, except that it wasn't awful, which, sadly is the standard for pizza in the area. So, if my family wanted pizza for pizza night, this would be my top pick. But ... I'd probably mostly opt for the knots. Ramunto's lists their sweet knots as appetizers, but, given the amount of sugar on these things, I classify them as desserts, always a necessary component of a meal for me. Cinnamon & Sugar Knot. $0.90. The sweet knots seem to have diverged between the establishments. We never ordered them when I was growing up, so I'm not sure which ones are the originals. Lebanon says "Soft dough knots brushed with melted butter and rolled w/ cinnamon & sugar. Comes with icing." Icing! Mine, from Hanover, did not have icing. They were basically the same as the savory version, just with butter replacing the oil, and cinnamon and sugar replacing the garlic, herbs, and cheese. And I really mean this. The insides were still too dry. The tops seemed over cooked. And the butter? Just as soaked in as the oil. Again, seriously, half an inch deep of just butter soaked bread. There was an insane amount of cinnamon and sugar caked on. Just like the savory ones, these were highly flawed, yet I couldn't help myself from consuming far more than one. I wished they were more moist. I wished they had less butter. 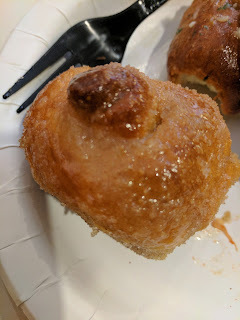 I wish the sugar was applied when the rolls were hot, or even baked on, so it caramelized instead of just being tons of sugar on the outside. Many things would make this better. But ... I still really enjoyed them. Even later once cold. Even the next day. The Hanover store sells these for the same price as the savory version, but Lebanon charges more, $4.49 for 6, $6.99 for a dozen. I was recently in Hanover, NH for a recruiting event at Dartmouth, where we had lunch catered by the local Boloco. 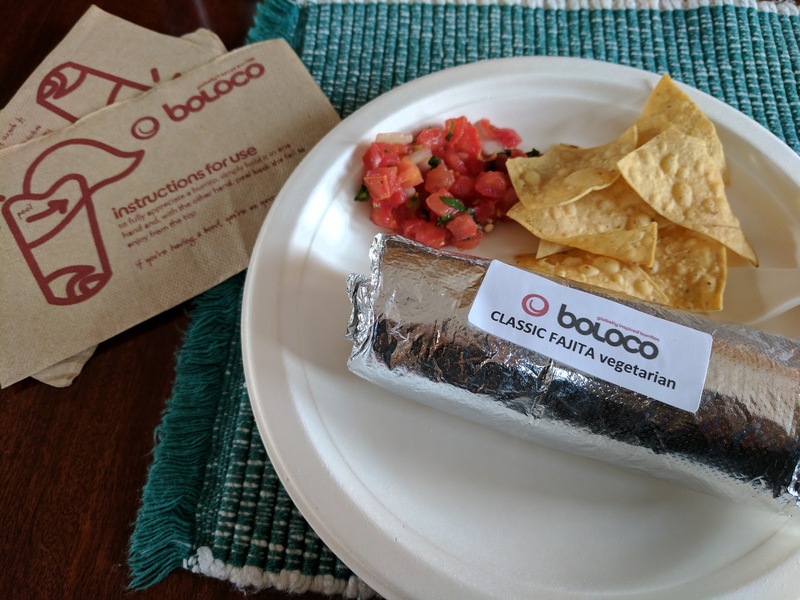 I knew of Boloco, a chain of fast casual burritos, with locations only in New England (and mostly Massachusetts), but this was my first time actually eating anything from there. For lunch, we had burritos, chips and salsa. I can't say I was excited for this, as I don't like Mexican food very much, and I don't really like burritos in particular (well, I don't like rice and beans). But the last recruiting event I did had Mexican catering from Rubio's and that was fantastic, so, I had a bit of hope. Plus, Boloco isn't really Mexican ... it is "globally inspired burritos", aka, basically just wraps. I wasn't impressed with Boloco, but, to be fair I didn't have any items I would have selected given the full menu. For our evening event, we had catering by Ramunto's (pizza, garlic knots, and cinnamon knots), and that was much more successful. Stay tuned! Our catering order arrived nicely packaged and was set up by the staff. 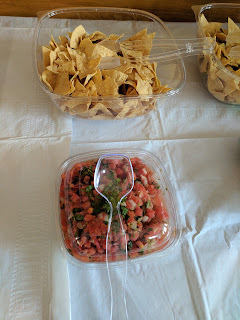 They laid out a white paper tablecloth, set up plates and utensils, opened up the chips and salsa buckets (and took the lids away, which was a problem when we had leftovers ...), put out serving utensils, and left the burritos in a closed box to keep in the heat. 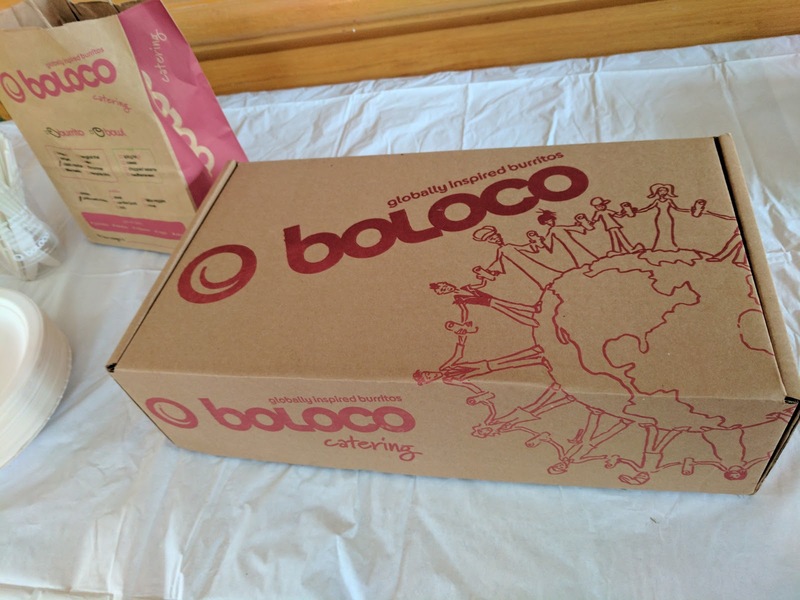 Boloco offers 3 tomato based salsas (mild, medium, and bold) plus corn and mango salsa. I'm not sure which this was, I think likely mild as it had no heat. I didn't like the salsa. The chunks of tomato were vibrant red, but, flavorless. It had no heat or spice to it. There was lots of raw white onion. Overall, just bland and not fresh tasting. The chips were pretty good though, very salty, but I liked that. Chips and salsa are normally $1.99 for a personal side, we were provided with giant containers as part of our package ($10/head including a burrito and drink per person). Classic Fajita Vegetarian, small size. $6.88. Boloco's concept is that you pick your style (buffalo, teriyaki, cajun, Bangkok thai, tikka masala, summer, or classic Mexican), then your type (burrito or bowl), then your size (mini, small, or original), your tortilla (white or wheat), your protein (white meat chicken, dark meat chicken, grass-fed steak, slow braised carnitas, tofu, fajita veggies), and then any additional things you'd like to add (other veggies, other grains, sauces/dressing, hummus, guac). I liked the sound of some of the styles, like the ones with tikka masala or thai peanut sauce, and I don't like rice or beans, so I could certainly have come up with a tasty custom version, but since this was a catered event, I didn't have options, and I didn't know what the different styles actually were as I hadn't been to Boloco before. I grabbed a "Classic Faijita Vegetarian" because I didn't want chicken or steak and the rest all seemed to be chicken or steak. Sadly this turned out to be just a boring veggie burrito, classic Mexican style with rice, pinto beans, cheese, salsa, and cilantro, in a wheat tortilla with some fajita veggies (onions and peppers). So ... yeah. Mushy rice and beans and the same flavorless salsa made up the majority of my fillings. I don't really like these things even when nicely prepared. The veggies were fine I guess, but I only found a few thin slivers of onion and peppers, and they were very soft and slimy. Speaking of slimy. The tortilla, likely because it was packaged up, was super moist and gummy. I didn't really like anything about the burrito. On the plus side, it was hot. The packaging was very effective. A small veggie burrito is normally $6.88, but this came as part of a catering package including chips, salsa, and drinks for $10 each.